Today, in 1971, Mariner-9, the first man-made object to orbit another planet, entered Martian orbit. The mission of the unmanned craft was to return photographs mapping 70% of the surface, and to study the planet's thin atmosphere, clouds, and hazes, together with its surface chemistry and seasonal changes. Mariner 9 was designed with the specific purpose of identifying potential sites for a future Viking spacecraft lander. Mariner 9 entered Mars orbit on November 13, 1971 and transmitted back to NASA a whopping 7329 pictures taken only 1390 km (862 miles) from the planet itself. Among these were the first pictures of the surface of Mars' two moons, Deimos and Phobos. From the Mariner 9 mission data, landing sites were picked for Vikings 1 and 2. These two identical spacecraft each consisted of a lander and an orbiter. Viking 1 was launched on August 20, 1975 and Viking 2 was sent up on September 9, 1975. The first landing ever to be accomplished on the surface of Mars was accomplished when the Viking lander set down on July 20, 1976 on Chryse Planitia (The Plains of Gold). 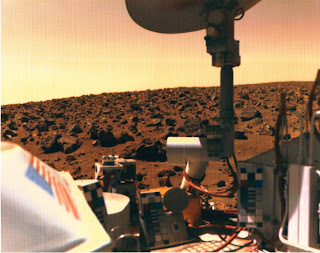 Below shows a picture taken by the Viking lander during its surveillance.